Now this is an old idea, one I did preparatory sketches for (yes, I do occasionally bother) like, centuries ago, in 2010 or something. 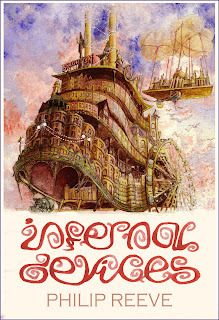 'Mortal Engines' by Philip Reeves is tops, and though it has had a couple of good covers, the current ones are just... I can't even talk about them. So this thought got ressurected (like a Stalker! Geddit?). I am way pleased with the result. The concept was inspired by this awesome poster of Abram Games', king of London Transport poster design. I'm particularly pleased with - well, everything, actually, I'm smug on this one - but especially the way the 'face' of the city looks a bit like an angler fish or something equally ugly and predatory. I like the colour scheme too. 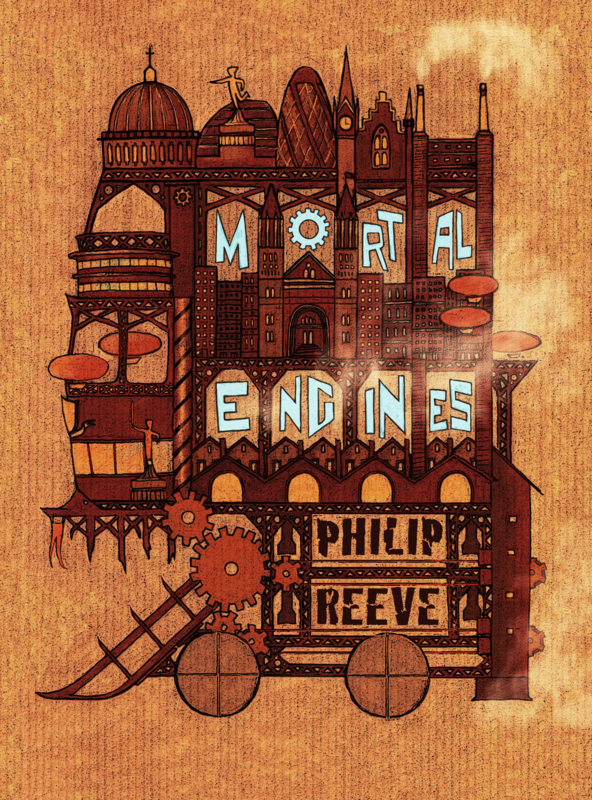 I know Philip Reeve's feelings about steampunk (he doesn't love it) and I pretty much share them. Without the cold blue of the title I think the picture might look too steampunkish, so I feel good about the colour choices. 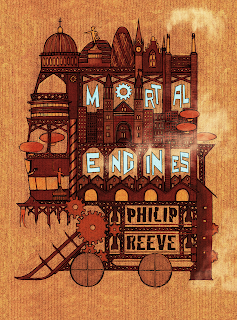 Philip Reeve also posted my picture on his blog, which was very cool. Then I did an 'Infernal Devices' cover. Skipping 'Predator's Gold' not because I don't like it, but because it doesn't have Brighton in it. And Brighton is my baby. It gets a bit of a battering from Reeve in the book, but since nothing he says about my stupid, self-satisfied, lovely town is untrue, I can't hold it against him. Also, he went to the same primary school as me. Not relevant, just interesting. To me. Um. As an image I like what I came up with. I like the kinda steamboat silhouette of Brighton-Literally-On-Sea. I also like the wavey title (although I suspect a design editor would point out it's not terribly legible). But I wouldn't be satisfied with it as a book cover. I might at some point mess around with the image a bit more and see if it can be made to work, with torture and bribes. we shall see.